Welcome to “Purr-adise.” These cats on the small Hawaiian island of Lanai have got it made. Amazing weather, meals served in their own “catfurteria,” occasional massages, and a steady influx of adoring fans ready to give them all the love and attention they could ever want. “Ninety-five percent of the cats that we bring into the sanctuary are completely feral, meaning they were born in the wild and they have never had any human interaction, until us,” said Keoni Vaughn, the executive director of the Lanai Cat Sanctuary, created to help address the island’s feral cat problem. 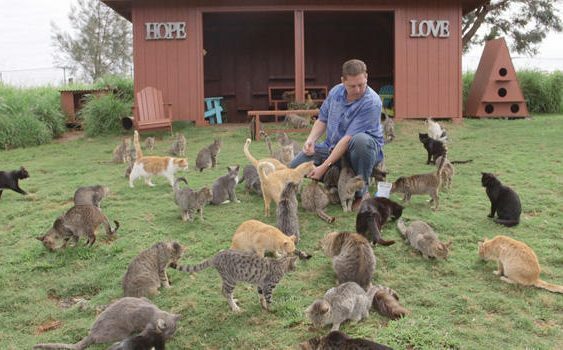 “I’m a 45-year-old male that runs a 600-cat sanctuary. I don’t mind being labeled the crazy cat guy!” Vaughn laughed. Keoni Vaughn, the “crazy cat guy” at the Lanai Cat Sanctuary. “Yeah, the cat ladies get a bad rap, but you never hear about the crazy cat guys!” said Knighton. Kathy “Kat” Carroll with Conor Knighton at the Lanai Cat Sanctuary. Cats were originally brought to Hawaii long ago on passing ships. Lanai’s open spaces and lack of predators led to an explosion in the feral cat population. On the cliffs right beside the Four Seasons, cats were running wild, and destroying the wildlife. The cats began to prey on native birds, like the wedge-tailed shearwater, which nest right into the sand. In the higher elevations, cats discovered the endangered Petrel, a Hawaiian bird that’s especially vulnerable. Since the cats are an invasive species in Hawaii, there was a fear that they might be euthanized. But Kat had a different idea. Six hundred cats have made the Lanai Cat Sanctuary their home. Now, cats that are trapped on the island are brought to this enclosed sanctuary. There’s no vet, so twice a month one flies over from Honolulu. While some of the feral cats spend all day in hiding, those who do venture out receive no shortage of attention. The Fur Seasons has turned into a surprisingly popular attraction. Only 3,000 or so people live on Lanai, so the sanctuary survives on donations from outside visitors. Today, there are definitely still feral cats roaming wild on Lanai, but Knighton didn’t see any. Maybe the word is starting to get out. “If I was a cat I’d be knocking on the door, like, ‘Hey, how do I get into this place? '” said Mendoza. It’s a place that the humans seem to enjoy just as much as the felines. Just be careful not to fall too deeply in love, or else you might end up going home with a cuddly souvenir: All of the cats are available for adoption.